The porphyrins can self organize to form macromolecular structures which can self replicate to form a porphyrin organism- porphyrions. The porphyrins can form a template on which RNA and DNA can form generating viroids. The porphyrins can also form a template on which prions can form. They all can join together – RNA viroids, DNA viroids, prions – to form primitive archaea. Climatic changes of global warming and ice age as well as EMF pollution can induce heme oxygenase, heme deficiency and increased porphyrin synthesis. Heme oxygenase is also induced by EMF pollution of the environment. Defect in heme synthesis and heme depletion leads to deficiency of heme enzymes. This produces the Warburg phenotype. The mitochondrial dysfunction leads onto insulin resistance and metabolic syndrome X. The Warburg phenotype and increased glycolysis leads to oncogenesis. The mitochondrial dysfunction can produce neurodegeneration. The increase in lymphocyte glycolysis can produce immune activation and autoimmune disease. 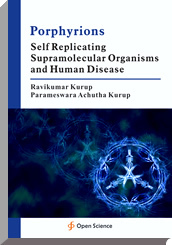 Porphyrions are self replicating supramolecular organisms forming the basis of civilizational diseases – metabolic syndrome x, oncogenesis, neurodegenerations, autoimmunity, schizophrenia and autism.